(NaturalNews) If you live on the West Coast of the U.S. or Canada, you may want to reconsider your water filtration method as well as how you select and prepare food. 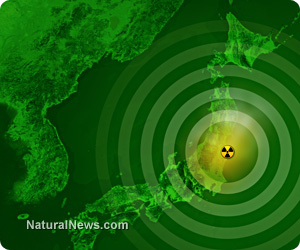 Evidently, the nightmare of Fukushima is far from over - another 16 million years to be exact. Due to the astonishingly long half-life of iodine-129, the whole ecosystem of the Pacific Coast will be contaminated pretty much forever. Among other dangerous radioactive isotopes released from the Fukushima meltdown, iodine-129 also spewed forth from the damaged reactor. Incredibly, this isotope has a half-life of 16 million years. Essentially, the entire West Coast food supply of North America will be contaminated with radiation for unlimited generations. We have fundamentally entered into a new way of life - one that takes a giant leap toward illness, disease and heightened mortality rates. "Iodine in the oceans enters the air from sea spray or as iodine gases. Once in the air, iodine can combine with water or with particles in the air and can enter the soil and surface water, or land on vegetation when these particles fall to the ground or when it rains. Iodine can remain in soil for a long time because it combines with organic material in the soil. It can also be taken up by plants that grow in the soil. Cows or other animals that eat these plants will take up the iodine in the plants. Iodine that enters surface water can reenter the air as iodine gases." "Radioactive iodine also forms naturally from chemical reactions high in the atmosphere. Most radioactive forms of iodine change very quickly (seconds to days) to stable elements that are not radioactive. However, one form, 129I, changes very slowly (millions of years), and its levels build up in the environment." Before packing up and relocating to Antarctica, a few options are available that can drastically reduce exposure to these harmful elements. - View all fish and crustaceans from the Pacific Ocean as tainted. - Always use filtered water for cooking and drinking. - Pay attention to the origin of dairy. - Wash any produce thoroughly with natural soap and rinse with purified water. - Avoid meat from contaminated regions (including wild game). "You can add Calcium Bentonite Clay to your milk and drinking water if you're concerned about the possibility of contamination there as well. Add approximately 1 ounce of liquid Calcium Bentonite Clay to a gallon of organic raw milk or water. Some people prefer to let the clay settle to the bottom of the liquid and discard that portion, while others prefer to shake it up and drink them together. Either is fine." All in all, it truly is a sad state of affairs when the idea of donning a hazmat suit simply to handle our food is not as outrageous as it once had been.